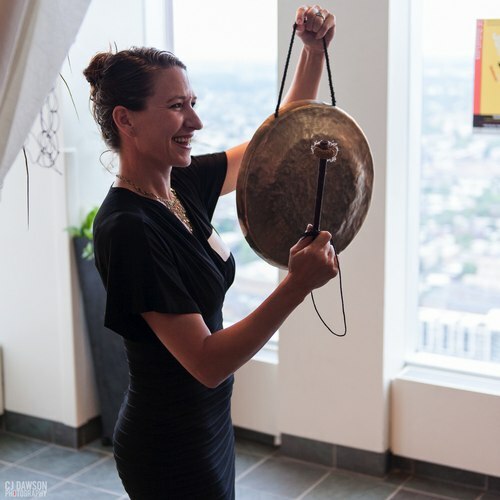 On June 4, BalletX hosted their fundraiser gala on the 50th floor at Vista Top of the Tower in CC Philadelphia. There was no celebrity red carpet, but it seemed like we were on one in the lobby leading into the Vista room, one of the swankiest spots in Center City, with one boffo panoramic view of the city. A collective glance at this crowd, flooded with natural lighting, reflecting up and downtown chic. At the center were the BalletX co-directors Matthew Neenan and Christine Cox warmly greeting everybody. Dancers may communicate silently most of the time, but Cox and Neenan know how to mingle and work a room. Neenan, in a pale blue Hugo Boss jacket (& cool Memphis pork pie) and Cox, didn't know the label on her knockout elegant black dancer body cocktail dress. Associate AD Tara Keating and BX dancers were dancing style and esprit around the room. 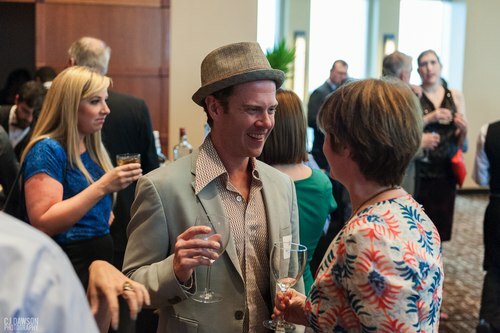 Many longtime patrons of the Philadelphia Arts Scene were in attendance, as well as leading figures in the business community. At the perfect moment, Cox sounded a gong to get the presentations started that included short films about the company and their goals. 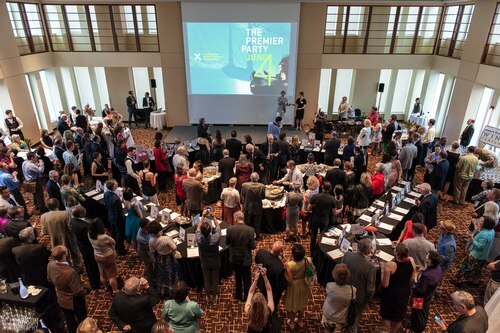 Cox announced that more than 200 people already made the evening a success. BX board member, Alan B. Palmer, pledged a gift of $25,000 to be earmarked for the creation of new work, if it is matched by 250 new donors by July 13. Cox thanked everyone from the reception committee to the silent auction donors, and her sincerity met with lusty applause. 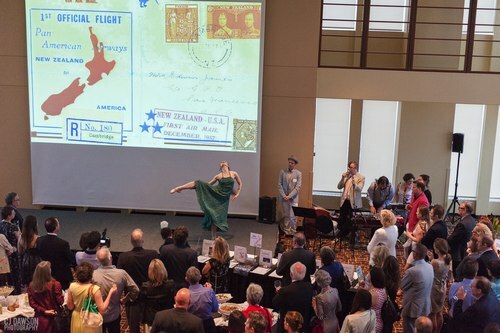 The final tally for bid at the silent auction tables, with dozens of area businesses and arts organizations contributing, exceeded the projected goal. "Matt and I started with two cell phones to get the company going and now we have an amazing staff." Neenan and Cox made a few more announcements about their next season and that the company will be on tour, along with Pennsylvania Ballet, at 2014 Vail International Dance Festival in July. Cox took particular pride in talking about the company's various outreach programs including their 11-week residency at Philadelphia's Jackson School, with programs based on techniques developed by Jacques d' Amboise for his National Dance Institute (NDI). Cox spoke passionately about the support Ballet X is getting in its 8th year as they try to continue to try to up the ante artistically and beyond the stage. As added inducement, Neenan, recently knighted 'one of today's foremost dance poets' by NYT's dance critic Alastair Macaulay (we in Philly have known it for a long time), was presenting a sneak peak of his upcoming ballet, SUNSET, o639 HOURS. Neenan introduced "my brilliant composer from New Zealand, and I have been brainstorming this piece for two years." Neenan described the long-form ballet about "Pan American pilot Edwin Musick and his amazing international story. We started rehearsing last week, it's been a little scary, because we're working the opposite than I usually do, we've been building the music and choreography together," Neenan said later that he was also adding elements of structured improv, in part because the musicians will be onstage with the dancers and at points moving around the dancers. Chloe Felestina dance a very sketch snippet of thematic improv from 'Sunset' with Langabeer performing on keyboard with Antique Matter, one of the many bands she with whom she collaborates. Neenan is creating his first full program dance work for BX which will premiere next month. Amid the silent auction tables sumptuous looking hors d'oeuvres vanished quickly and the Pravda Vodka martinis and Moore Brothers wine bars did their part in lubricating the crowd. The temperature in the room was hot for this dance troupe and they are ready to open their pocket books. In fact, one balletXOmane paid $1,100 for a very swank Ralph Lauren bag that was part of the non-silent auction, hosted by comedian and tv host Chuck Nice, who was not only a lighting-round auctioneer, but was very funny doing it. Bids for dinner for six with Neenan, Cox and Keating hosted by a locally celebrated chef went for $1,500 and then was doubled, in a matter of seconds by Nice. The auction reached such a pitch that at its end the evening just naturally started to wind down. On a side note, one of the highlights of the evening was there was no bad social dancing, a plague at similar events in Philly.